My dear friend Dena, is a huge fan and collector of Coca-Cola products. Her kitchen is decorated Coca-Cola themed. She also loves refinishing furniture, specifically dressers and she is really creative with her renovations. I absolutely love the old dresser she transformed to look like an old-fashioned Coca-Cola Machine and I asked Dena for her permission to share her design on my blog, with all of you. The dresser she ended up gifting to another friend of hers. What a wonderful present right?! I love it! Thank you, Dena, for letting me share! Dena beautifully hand wrote the Coca-Cola logo on the front and sides of the dresser. After redoing the outside of the dresser my detail-oriented friend Dena, took three vintage Coca-Cola calendars she had saved and Modge Podged the pages into the inside bottom of the drawers. The drawers are shown in the video posted below. If you do decide to make this project or any of our crafts. We would appreciate it, if you can share a picture on our Facebook page . We would love to see how your projects turn out! 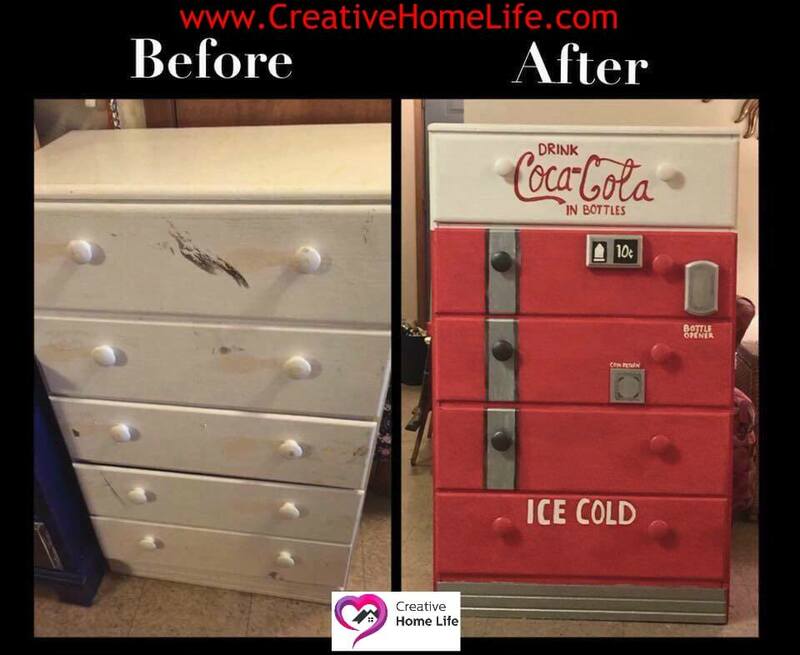 If you have any questions about Dena’s “Dresser Refinished To Look Like a Coca-Cola Machine”, or anything else… Please feel free to message me or leave a comment.